If the blue queens removed, each pink queens do not attack each other. If the pink queens removed, each blue queens do not attack each other. 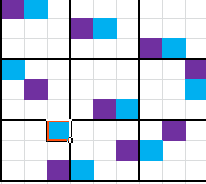 Each 3×3 red square, only have 1 blue queen and 1 pink queen. Some queens have been placed as guide. 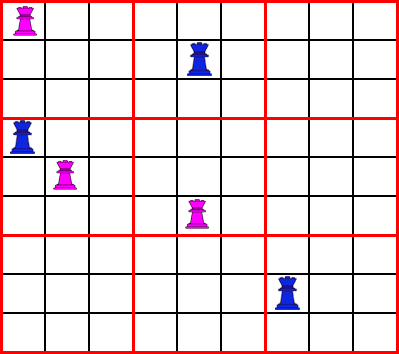 Where Q indicates a purple queen and q indicates a blue queen. There is only 1 possibility for the blue queen in the middle lower square. From there, the blue queen in the central square (<-- this is where I went wrong) and subsequently in the middle right square and the top left square can be determined, from which we get the remaining blue queens as well. Now, only 1 possibility is left for the pink queen in the bottom left square. From there, the other pink queens are easily determined. EDIT: Ah, I somehow made a mistake eliminating one of the fields in the central square. Will post an updated version with explanation, though I presume I will end up at the same solution as Skyvask. The middle lower blue queen is still determined, which gives the lower left queen. That gives the lower left pink queen as well, which determines the pink queen in the lower middle square. Then, the middle top pink queen is determined, from which we can also deduce, in order, the lower right, lower left, and middle right and top right pink queens. We can also deduce the top left blue queen now. From there, we get the central blue queen, and can then easily fill in the middle right and top right blue queens. Since all of the above is logically deduced, this also proves that is a unique solution.